Let me be upfront with this: I am not a fan of some of Fleming’s recordings. I admire Fleming greatly for her musical curiosity and intelligence, and her recordings range from Berg’s Lulu Suite to the final scene of Bellini’s Sonnambula to Leonard Cohen’s Hallelujah, but recently I have begun to find her singing slightly overcalculated. Particularly in music that is easy for her (and no matter what anyone says, she has a fabulous technique), she can overemote and focus on textual details in a fussy, Schwarzkopfian manner. However, I am happy to say that her lastest CD of French song cycles is one of her best recordings. 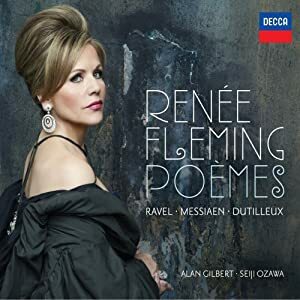 Renee Fleming has been Decca’s superstar artist for a long time, and only someone with her recognition and fame would be able to make a recording like this. Of the three pieces, the Ravel is the best known and the one that she is least comfortable with. The piece was a specialty of Regine Crespin and has recently been recorded by Susan Graham, Magdalena Kasarova, and Jennifer Larmore, so the fact that the piece sits slightly too low for Fleming is not a surprise. My favourite among the three was “L’indifferent”, in which she maintained her trademark beautiful voice while bringing out different subtleties in the text. However, no matter how well she sings, she cannot match the seductive sound of Crespin or de los Angeles. Although Messiaen’s are barely in the standard repertoire, I have had the good fortune to play two of his pieces – his Theme and Variations for violin and Piano, and the last movement of his monumental Quatuor pour la fin du temps. He writes very well for the violin, and I really love those pieces. However, I heard Fleming perform his “Poemes pour Mi” in recital a year or two ago, and I didn’t understand the music at all. Now, I still can’t say that I really understand it either, but the beautiful combination of her voice and the creative orchestration is enough for me to enjoy. The music is not Messiaen’s most modern – most of it is semi-spoken (is there a French equivalent to parlando) and highly reminiscent of Debussy’s Pelleas et Melisande. However, there are enough dissonant or intense moments in the score to keep me from falling into a trance. Hopefully, I will grow to appreciate the music and this performance more. More interesting for me are Dutilleux’s pieces – two sonnets from the 50s and “Le Temps Horloge” written a few years ago for Fleming. Dutilleux’s composing style really hasn’t changed that much over the 60-year span, and the music is more atonal than Messiaen’s. Both cycles are filled with interesting intervals and a wide vocal range, and coupled with fascinating orchestrations (harpsichord and accordion in the same piece?) makes for a thrilling listen. Although most will buy this CD for the Ravel or the Messiaen, the Dutilleux is currently my favourite. All of the pieces have very important and at times very virtuosic orchestral parts, and both the Orchestre Philharmonique de Radio France under Alan Gilbert and the Orchestre National de France under Seiji Ozawa play these difficult scores accurately and expressively. Definitely a worthwhile recording, and I hope Fleming continues to use her fame to explore new repertoire. Thank you for the review. There almost is a French word for parlando, well two actually but they’re linke together “parlé-chanté” which comes from Sprechgesang in German. This is how Pelléas et Mélisande has to be sung for instance.